In 1998, on one of his many visits to the Hamptons, President Clinton was presented with historic information about the Sag Harbor Whaling and Historical Museum. Once back in Washington, he handed the information over to the First Lady, who began the process of declaring our building a National Treasure. 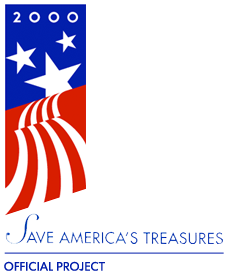 After much correspondence with Mrs. Clinton, the building which houses our museum was accepted as an official project of the Save America's Treasures program. Built in 1845 for $7,000, this building was originally the home of Benjamin Huntting II and his family. A leading citizen of Sag Harbor, Benjamin Huntting was the owner of whaling ships and made his fortune from the whale oil that was brought home on his ships. To design his family's home, Huntting enlisted the prominent 19th century American architect Minard LaFever. LaFever incorporated exquisitely detailed plaster ceilings and carved wooden door frames inside, with the temple-fronted portico and ornate corinthian columns on the outside, to make this building a piece of artwork not to be missed. After Huntting's death in 1867, his home was purchased by the well known philanthropist Mrs. Russell Sage, who occupied it as a summer cottage until the time of her death in 1918. In 1920 the building was purchased by the Masonic Lodge. The local historical society began exhibiting some of their artifacts on the ground floor shortly thereafter, and in 1945 the building was deeded to the museum. The Sag Harbor Whaling and Historical Museum now owns the building, while the Masonic Lodge still uses the second floor as a Masonic Temple. and is listed on the National Register of Historic Places.